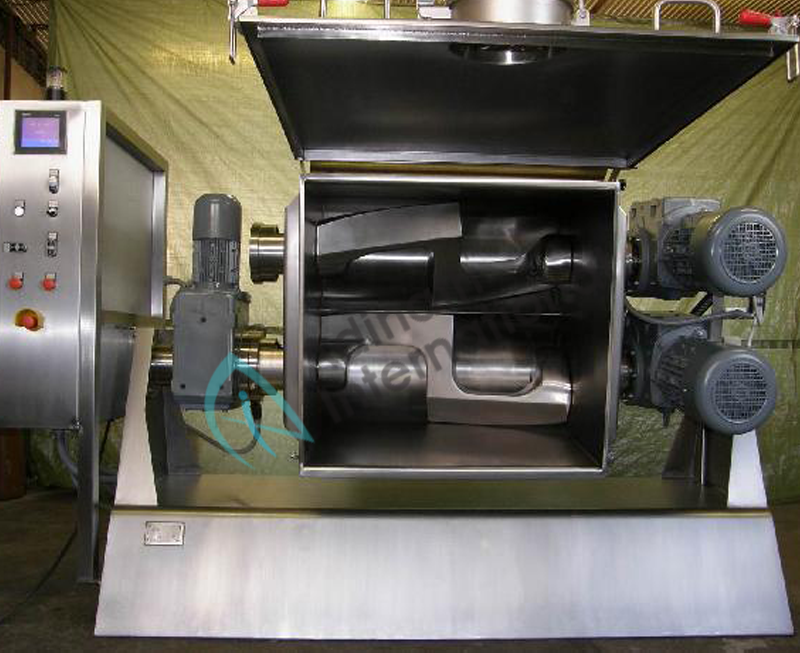 Z Blade Mixer is uses for uniform mixing of semi solid materials. Machine consist of U trough bowl with two ‘Z’ shape blades each rotates in opposite direction for proper mixing of material. Machine equipped with suitable capacity motor & gearbox decided as per characteristics of the product & process. Equipment is provided with Jacket arrangement for heating or cooling applications. We manufacture Sigma Mixer Kneader in capacity ranging from 5 kgs. up to 5000 kgs. Z Blade Sigma Mixer is widely uses for mixing glass putty, plasticizer solution, biscuit dough, sauce, polymers etc. Available in Stainless Steel 316, Stainless Steel 304 and Mild Steel materials. Stainless Steel polish to matt & mirror finish as per customer’s requirements. Mild Steel finish with one coat of red oxide and two coats of epoxy paint. Discharge option of hand wheel operated (manual) or hydraulic operated (automatic) offered. Jacket for heating or cooling application can be offered. Mineral wool insulation with cladding on jacket. Tangential designed ‘Z’ blades offered for uniform mixing. PTFE made shaft sealing provided for food grade compatibility. Minimum gap between trough inner shell & blades remove possibility of sticking product. ASM – 50 50 80 5 H.P. 7.5 H.P. ASM – 75 75 110 7.5 H.P. 10 H.P. ASM – 100 100 150 10 H.P. 15 H.P. ASM – 150 150 200 15 H.P. 20 H.P. ASM – 200 200 300 20 H.P. 25 H.P. ASM – 400 400 550 30 H.P. 40 H.P. ASM – 500 500 750 40 H.P. 50 H.P. ASM – 750 750 1150 50 H.P. 60 H.P. ASM – 1000 1000 1500 60 H.P. 70 H.P. ASM – 1500 1500 2100 75 H.P. 80 H.P. ASM – 2000 2000 2600 80 H.P. 90 H.P. ASM – 3000 3000 3800 100 H.P. 120 H.P. * Power voltage can be adjusted as per customer’s domestic power voltage requirements. * Rights of technical improvements & modification reserved. * Illustrations & dimensions are shown for information purpose only.